Price-Related Offers – Can be a direct cash cut-off (e.g. : $2 Discount) or percentage-based discount (10% Off). The principle of this incentive is to use a straightforward monetary value to entice customers. They also appear as coupon codes. Samples or Freebies – Can be a tangible (e.g. : physical product sample) or intangible offer (e.g. : free shipping, free trial). They provide a low-risk strategy to get shoppers to try your product or services. Events or Experiences – Activities that customers might be interested in such as VIP events, celebrations, special appearances or product launches. Have a clear figure of your end goal – Know exactly what you want to achieve with your promotions. Do you want to generate more sales or bring more customers in? Based on your goal, ask whether how much or how many you want to pull off. Plan your incentive – What kind of incentives are you willing to trade off in order to generate the desired action from your customers? Is it price discount, coupons, product samples, etc.? Employ a process and strategy – How do you plan to achieve your goals? What are the processes that you will implement to make your sales promotions materialize? Are you going to use tools or WooCommerce plugins to be more efficient? Calculate the potential impact to your bottom-line – Know the impact of your promotion to determine your budget allocation, possible resources needed, and other expenses that might be incurred. In the end, you want to know if you’re going to be profitable if you run this sales promotion. Test and measure performance – Test different types of sales promotions that work best for your online store. Don’t forget to gauge your performance to uncover areas for improvement. A lead magnet is an enticing offer that you can barter to a visitor. The most popular and effective lead magnets are downloadable contents such as whitepapers or guides. Usually, you can use these lead magnets to grow your email subscription or social following. While you might be tempted to offer plain discounts or coupons, for eCommerce stores, you can create content-based tactics as your incentives too. A fashion online retailer can offer an in-season lookbook or an online coffee retailer can provide coffee lover’s guide as lead magnets. 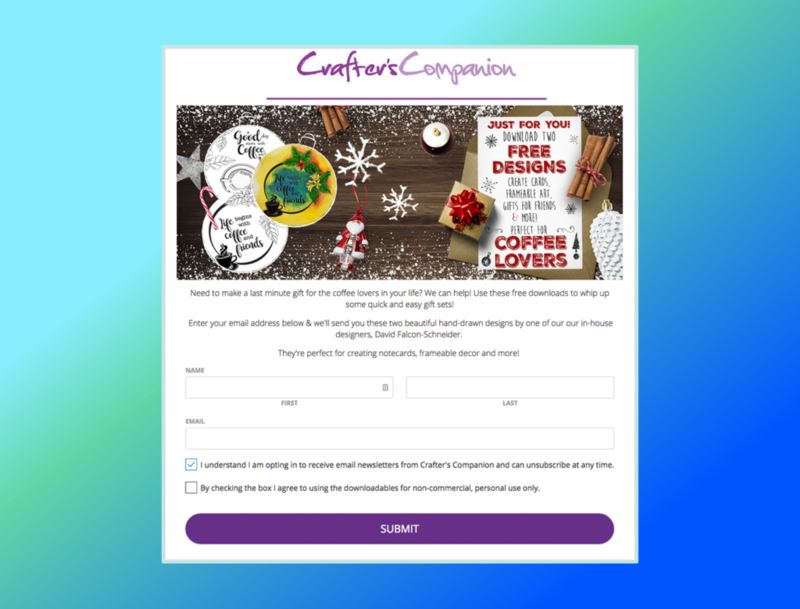 For instance, Crafter’s Companion created a creative lead magnet to target coffee lovers by offering them with free and downloadable designs to create cards, frameable art and gift. An entry pop-up is a pop-up displayed at the moment a visitor enters your website. Generally, the pop-up blocks the visitor from viewing your page without engaging with or closing it. Thus, it’s a clever promotional idea because it directly gravitates the visitor to the promotion and requires to notice it. For those reasons, entry pop-up offers can be extremely effective for conversion. Moreover, if, for instance, they won’t act immediately with the offer, your visitors are already primed that they have access to promotional discounts or deals even before they begin their shopping. A perfect example is Giah Swim’s 15% discount offer displayed seconds after a visitor enters its website. The online store uses Better Coupon Box, a built-in app in Beeketing for WooCommerce. The same principle of entry popup offers applies to exit intent. However, the timing and motivation have changed. 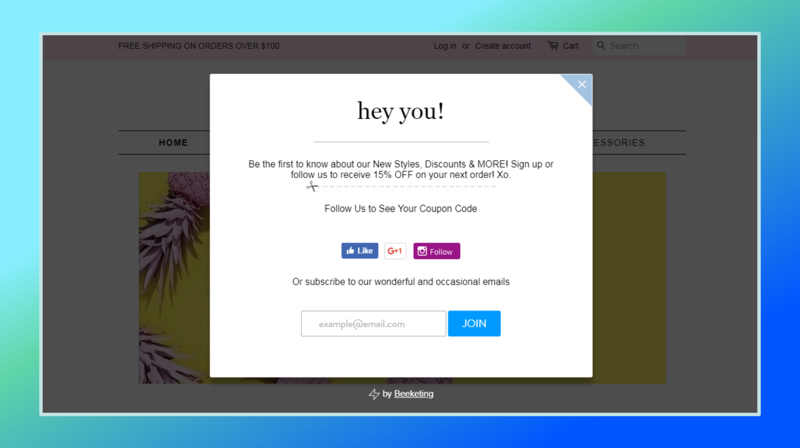 As the name suggests, exit-intent popup offer will be triggered once a shopper is about to exit or abandon your website without a successful purchase. The exit-intent technology has an inherent benefit of preventing cart abandonment because visitors will pause to check the popup message before leaving the site. You can trigger your own exit-intent popup using the Checkout Boost tool from Beeketing for WooCommerce. It enables online stores owner to entice shoppers with an offer when they’re about to abandon their carts. 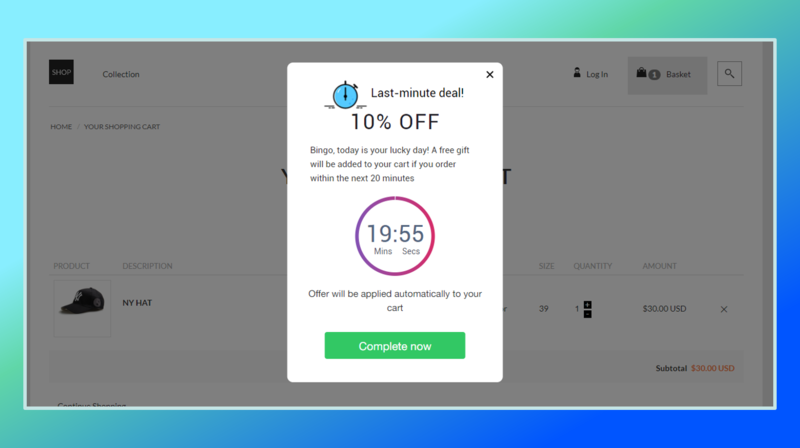 Plus, you can increase urgency by adding a countdown timer to your offer. 55 percent of global online consumers are willing to pay more for products or services from businesses that are devoted to corporate social responsibility. 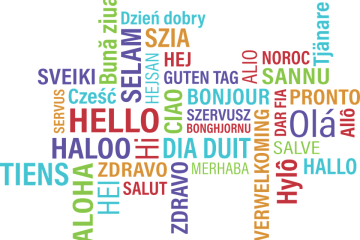 With that growing expectation, online stores must apportion its sales and marketing efforts towards the community’s well being. And that’s what purpose marketing is all about. Purpose marketing is a wide range of business strategies that uplifts the community. It can be a charitable donation or supporting your local community’s activities. It’s a win-win for your community and for your business. It improves the quality of life and then builds a positive brand reputation. For example, you can run a sales promotion that encourages shoppers to buy a product and at the same time will others. Tom’s ONE FOR ONE charity program is a classic example of this promotion idea. Every time a TOMS product is purchased, a person in need is provided with appropriate care. Ever since its commencement, the program has helped over 2 million children. Live streaming capabilities from social media giants such as Facebook and Instagram have paved the way to a new kind of engagement. With live streaming exponentially growing over just a short span of time, viewers watch live streams 3 times longer and generate about 10 times as many comments than pre-recorded videos. To tap this trend, host your sales promotion in a live stream. This kind of sales promotion idea generates urgency, suspense, intimate and unscripted moments from shoppers. There’s an instant engagement, feedback, and conversion. You can gain more traction by partnering with well-known endorsers or influencers. A perfect case was made by Maimai, China’s largest automobile eCommerce website when it hosted the live stream campaign called ‘The Meow Car’. The live stream was accompanied by sales promotion which viewed by more than 350,000 people. After 90 minutes of live streaming, it generated US$14 million. Chatbots are software programs that imitate basic human discussion. These chatbots have boomed and now more than 1.4 billion people annually are interacting with them. Chatbots run inside apps like Facebook Messenger or website modules. Like a normal conversation, chatbots communicate back and forth with shoppers to fulfill any kind of tasks like placing an order, finding an item, and recommending products. This new way of customer interaction is also an innovate sales promotion idea where you can not only help online shoppers with what they need, but you can also run your promos in a subtle manner. An effective practice is from Sephora’s Color Match bot for Messenger which helps shoppers look for a Sephora lipstick. Based on a photo that shoppers uploaded, the chatbot will recommend the most suited product or suggest a sales promo to entice them to purchase. The Facebook Chat by Beeketing for WooCommerce will seamlessly integrate your WooCommerce store and Messenger to have your own live chat. A doorbuster sale is a strategy that involves offering very attractive low price deals to get shoppers into your online store. Once the shoppers have visited your eCommerce store, they are also, then, exposed to other items and deals that your store has to offer. Now, that’s a clever way to draw more traffic to your store. Influencer marketing has proved its impact on online shopping as it generates 37% higher customer retention rate compared to other acquisition channels. This expanding reach and effectiveness of influencers is a good inclusion to your sales promotion ideas. Select influencers that reflect your target audience and match your brand ideals. 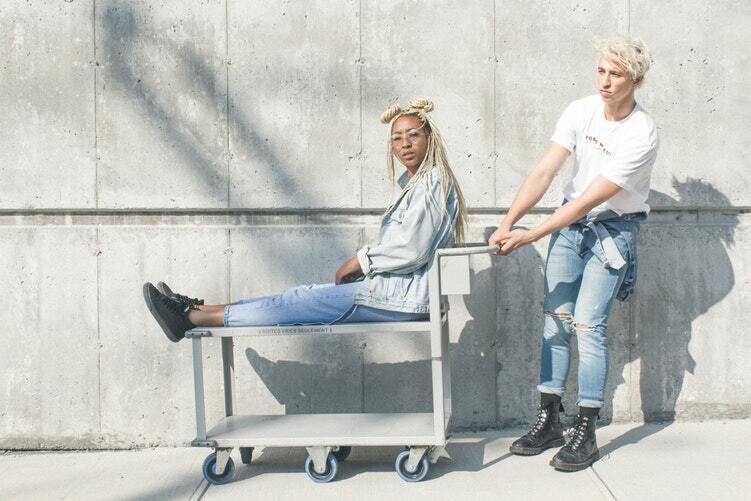 They don’t necessarily have to be mega-influencers which tend to be more costly. Find the ones with good authority, reputation, and engagement. Depending on your promotional budget, you can give your chosen influencers with a unique promo code that their followers can use when purchasing items from your site. This unique promo code also helps you track and monitor the redemption rate. 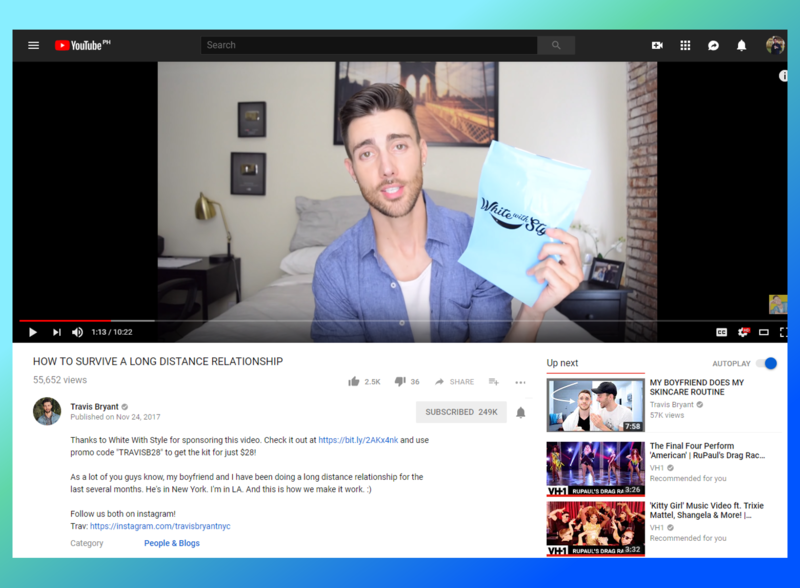 In practice, eCommerce stores would make a deal for a social media post and a product placement on a blog or Vlog like White With Style’s sponsored Youtube video with promo code. Gauging your customer’s experience and satisfaction is an indispensable ingredient to measure success. 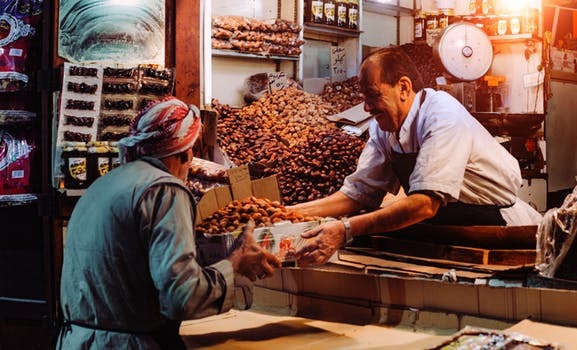 This is why being proactive in obtaining feedback through customer surveys will indicate to your shoppers that what they think and how they feel matter to you. Shoppers trust, stay engaged and remain loyal with online stores that put their opinions first. Aside from gaining customer insights through feedback, you can also leverage this avenue as one of your sales promotion ideas. For instance, you can motivate your shoppers to answer the survey by offering a discount or a chance to win a raffle promo just like Shaver Shop win a $200 gift card promo attached to its online survey. 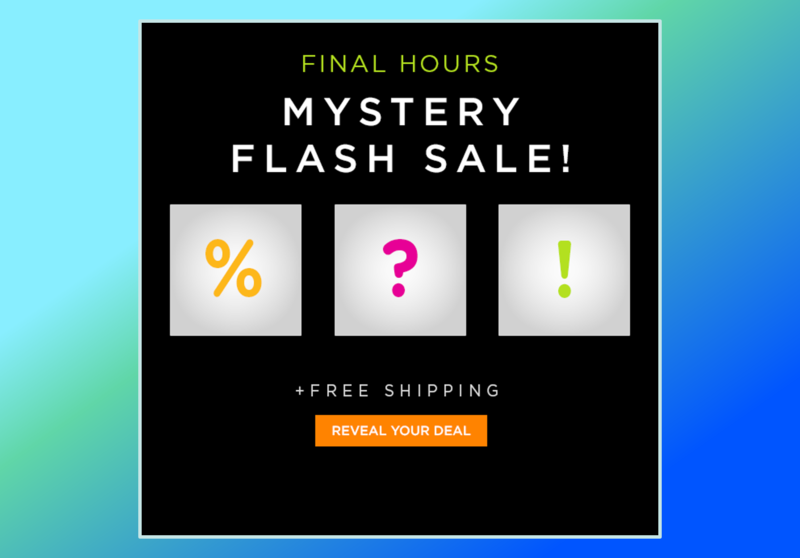 One of the best ingredients for a successful sales promotion is adding a hint of mystery and suspense. The use of mystery ignites curiosity from shoppers, thus, attracting them more to check out what you’re offering. When a customer posts a positive feedback, review, photo, video or story of a product or a brand on social media or any other online avenue, that customer is satisfied or excited enough to spend some time to do that. When a customer does create a post for a brand or product, that’s called user-generated contents (UGC’s). UGCs tell a more compelling narrative than a brand-generated advertisement ever could. This is why you need to motivate your shoppers to create UGCs for your online store. 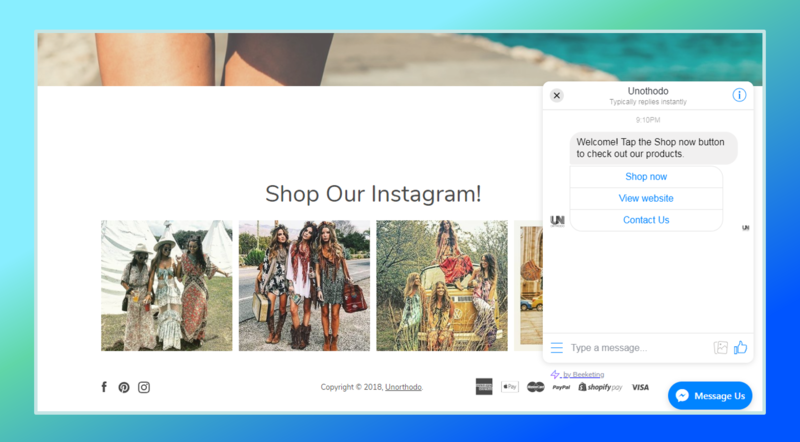 For example, you can create a UGC contest that encourages your shoppers to post a comment and photo about their experience about any of your products in exchange for a giveaway prize. 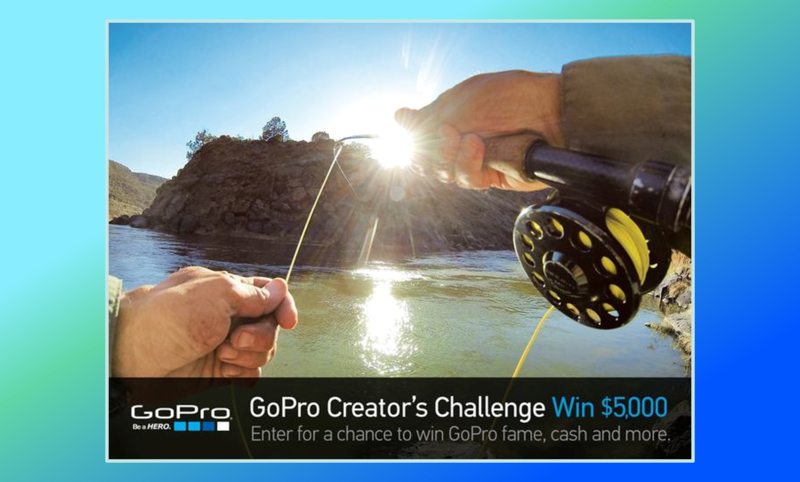 Have a look at GoPro’s Creator’s Challenge that gave people a chance to win $5,000 by entering their very own GoPro video creation showcasing their passions. When it comes to running your online store’s sales promotion ideas, you should remember that there are multiple factors to consider. However, you should always focus on what matters: your customers. All sales promotions should put the customers at the center. 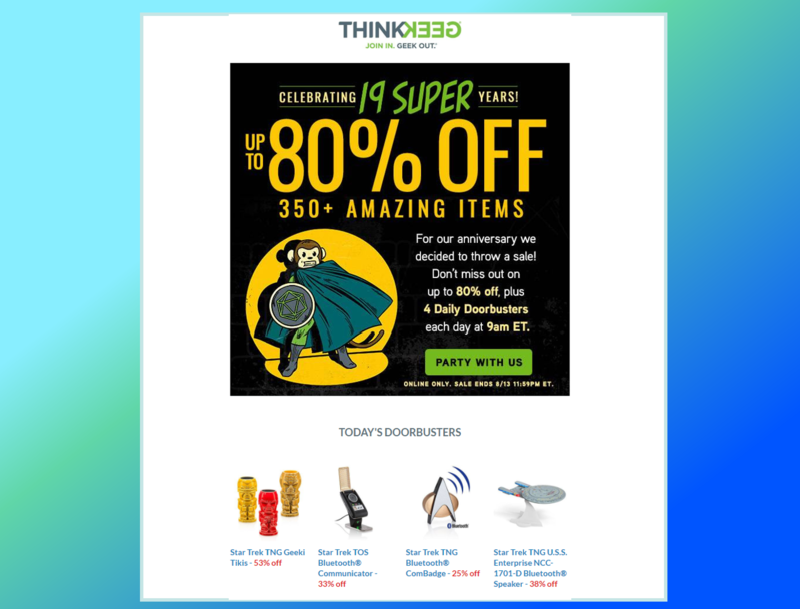 The way sales promotions work, why they’re being offered, and even the end-to-end process should be focused on the shoppers. They should be offered engagingly at the right place at the right time and not forcibly and annoyingly. The most effective promotions are the ones that add value to your customers. Michelle is an entrepreneur, writer, and growth hacker. 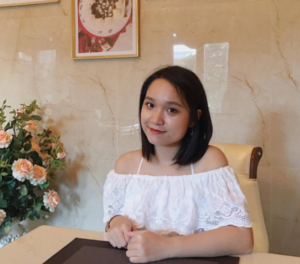 As a growth hacker at Beeketing, her in-depth guides and articles help store owners to manage, grow and scale their eCommerce business. When she’s not ferociously following and covering the eCommerce industry, she’s busy writing SEO-friendly copy that converts.